Enter Eye of the Beholder's world of Reverse Applique! 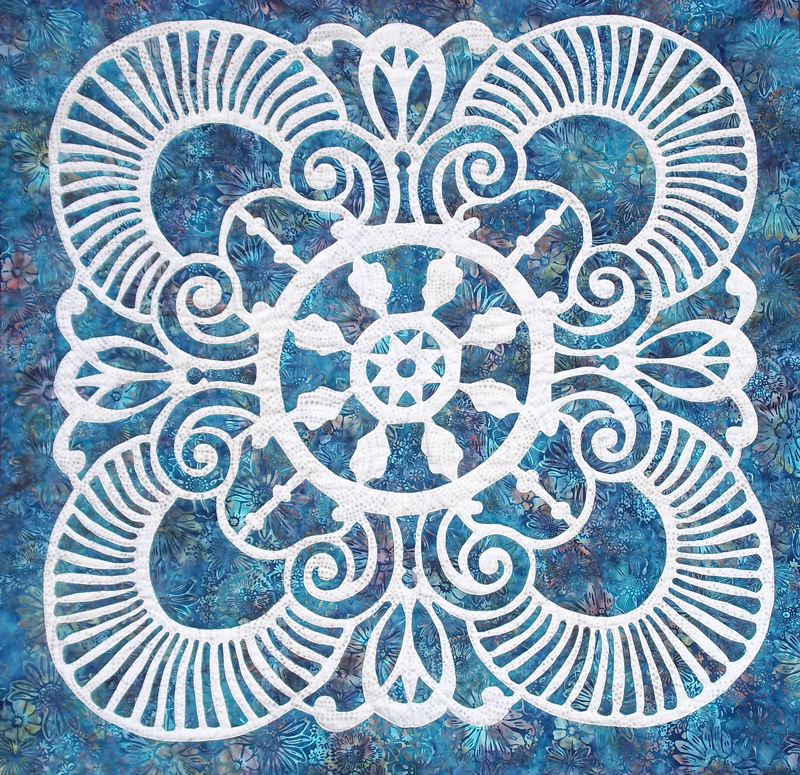 See our unique original designs for quilts, table runners, medallions and pillows. The Iris is our 9th and final flower pattern for the Victorian Flower Garden Quilt. Get all 9 flowers plus the applique sashing and borders to make your own, and enjoy a Victorian Flower Garden Quilt IV all year long! For hand or machine reverse applique or add dimension combining applique with reverse applique. Get our newest patterns designed for Island Batik! Illumination and Vintage Jewel! See our newest designs on social media. - Illumination is the 10th pattern in our Medallion Series for hand or machine creation. Dispel the darkness with Illumination! Pattern includes an optional border to turn the 36" medallion into a 56" quilt to warm your lap or decorate a wall. - Vintage Jewel table runner(18" x 43") is reminiscent of a ring or brooch, with it's central "amethyst" stones set in a cutaway, filigree design. It came forth from a doodle in my prayer journal and derived its name from an exhibit of Cartier's designs. And don't forget our ever popular patterns! All come with complete directions for all creation options, and full-size pattern pieces-there's no enlarging or re-positioning needed as you transfer the design to fabric. Patterns are supported by technique tutorials and blogs on our website- www.eobquiltdesign.com. Captain's Wheel (36" x 36"). Hand reverse applique. I AM AQS special. "Conquering Reverse Applique", Saturday, August 13, 11:00 am. FREE DEMOS in our booth! Learn how to reverse applique by hand or machine using Trace! Baste! Snip! & Stitch! at any time. 2 for $22! Christmas Berries Medallion VII and Victorian Urn table runner for one great price-normally $42.00. Plus we are an I AM AQS - AQS members get a 25% off on Captain's Wheel, Medallion IV. Barbara's Medallion started it all. TEN Medallions to choose from! Lovely as wall-hangings or as the center of a quilt. Can't choose, get all of them. Its a laser cut kit! Victorian Urn in Teal. ...all the helpful notions you'll want to help you stitch with success! Select John James needles; quilting thread; Beam N' Read personal light and USB/AC Adaptor; Desk Needle Threader; 3 kinds of Kai scissors honed just for us! And now, Soft Fuse (37" x 3 yds)-our favorite iron-on fusible! For our Wholesale customers- Patterns distributed through Eye of the Beholder, Checker Distributors, Erie Quilt Art, and, select patterns through, Island Batik.